Cyndi Grasman said sales at Bad Pickle Tees have doubled since she began selling the shirts online a year ago. NEW YORK — It’s cheap. It’s easy to do. And it can take less than 20 minutes to set up. Yet more than half of all small businesses still don’t have a website. Small businesses that don’t have one say they don’t have the time, think it will cost too much, or don’t want the rush of orders that comes with being online. But entrepreneurs who have jumped to the digital side say their websites have boosted sales, cut down on time-consuming phone calls, and brought more people into their stores. Steve Love has never had a website for the handmade sausage and meat business he’s owned since 1988. He said a website for LoveLand Farms would boost sales, and he doesn’t have any more farmland to raise hogs and Black Angus cattle. But customers expect one. When they ask him at the farmers’ market if he has a website, he hands them a card with his phone number and a map to his shop called the Sausage Shack in Nashville, Ind. He has no plans to start a website anytime soon. But it could happen in the future if his kids want to take over and grow the business. ‘‘I wouldn’t say never,’’ Love said. Bill Peatman, who writes blog posts, e-mails, and other content for websites for his corporate clients, doesn’t have one for his own business. Fifty-five percent of small businesses don’t have a website, according to a 2013 survey of more than 3,800 small businesses conducted by Google and research company Ipsos. That’s a slight improvement from the year before, when 58 percent said they didn’t have a website. Small business owners who want to start a website have lots of options that make it easier than in the past. Companies such as Wix.com, Google, SquareSpace.com, and Weebly.com don’t require coding or technical skills. Users can choose a template, drag in photos, and paste in words. And with more people searching for businesses online and on their smartphones, companies without a site might be missing out on extra business. Sales at Bad Pickle Tees have doubled since Cyndi Grasman began selling her quirky food-related T-shirts online a year ago. 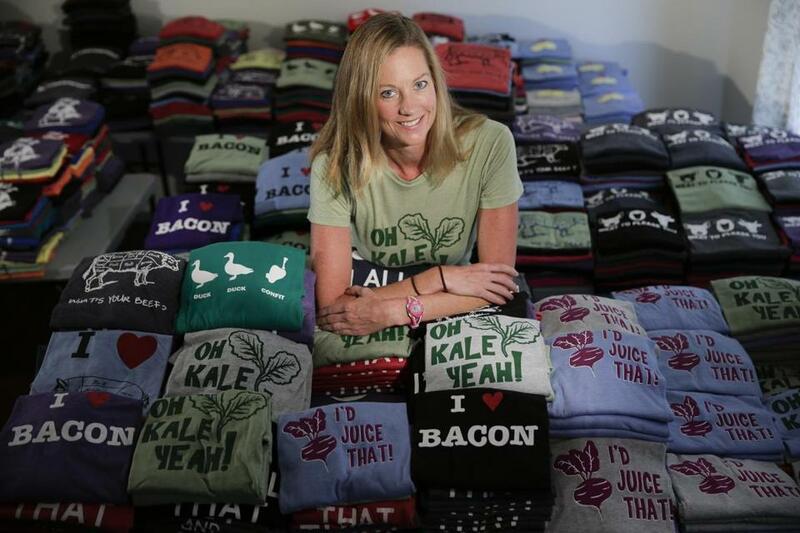 She started the business in 2012, selling shirts with sayings like ‘‘Oh Kale Yeah!’’ and ‘‘I Heart Bacon’’ at food festivals. She launched the site using website publishing company Weebly, paying $250 a year. ‘‘I’m reaching a larger audience,’’ she said. Marilyn Caskey, owner of The Garment Exchange, launched a website for her San Antonio consignment shop two years ago using a Google program. The store used to get calls all the time asking which clothing designers the shop resells. Amy Gilson hopes to be able to do that soon for her Oklahoma City snack food business Healthy Cravings. All customers see on EatHealthyCravings.com is a message that the site is coming soon.